She was the HOMERIC, Home Line's giant swan song...the third and last ship ever built to the order of that enigmatic concern. Whatever and whoever was behind it...and some damn impressive names in the shipping business lent their talents and cash to the concern in its four decades of existence, Home Lines built on the finest Viennese, Triestine and Genoese traditions of hotel service at sea to transform itself over the years from a carrier of displaced persons and migrants in the middle and late 1940s to a solid middle class carrier by the 1950s. Leaving the race for the creme de la creme on the Mediterranean to New York run to Italian Line and American Export Lines, Home Lines settled in to occupy a solid niche in the middle, carrying hordes of tourists back and forth across the Atlantic and perfecting the concept of the one week all-inclusive cruise from a North American port. By the mid 1960s, when airplanes had killed off all but the stragglers on the North Atlantic, Home Lines introduced the OCEANIC. Once it was late enough for people to have forgotten the initial intention for the ship to work as a two class liner between Italy and Canada in the summer and cruise as a one-class ship from New York for the remainder of the year, Home Lines proudly proclaimed that their 39,000 tonner was "the largest ship built exclusively for cruising." Such is the nature of the cruise business. Outsiders don't pay much attention, insiders are there mostly because it's a job and they need to eat...and the facts get lost in the shuffle. Bearing that in mind, after introducing the ATLANTIC (now MSC Cruises MELODY) in 1982, Home Lines signed a contract with Germany's Meyer Werft for the construction of another new ship, the HOMERIC. Second of the name, Home Lines expected her to capitalize on the fondness people still had for their original HOMERIC, gone from the scene a decade or so prior...but where the old HOMERIC was all charm and style, the new HOMERIC was, frankly, rather a mess with little going for her save her size and the many amenities now standard in new tonnage. 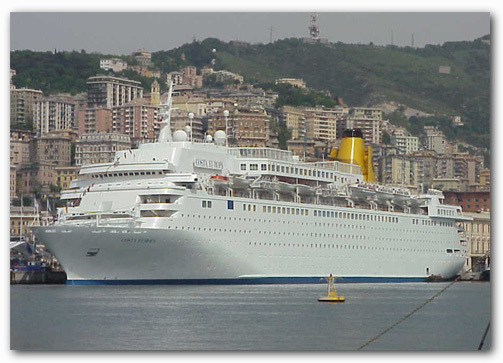 She began sailing for Costa in April of 2002 after minor interior refurbishment. The cabins have not changed since her days as the Westerdam and only minor changes were made to the deor of the public rooms. As a result, the decor is now a bit dated and in different places (particularly the Theater and Disco) is tired-looking. Compared to some of the other ships in the Costa fleet the ship lacks the unique charm of "Cruising Italian Style", even if she is very rich of art works (although most of them are Dutch or East Colonial from her days with HAL). As was the case when she sailed for HAL, there is a nice choice of public lounges, but the decor is a bit dated and tired in many places, particularly in the Atlantis Theater and in the Laodonte Disco. One of the nicer rooms on board is the large Meedusa Ballroom (the former Admiral's Lounge), completely remodelled in red and yellow. If you love classic music go to the Argo Lounge to hear the performance of a talented violinist. The comfortable library and Internet center are located nearby. The Casino was reduced in size to create the Squok Club (a kid's center) and is always cramped. The fitness facilities are excellent, with two large pools, including one with a magrodome retractable roof, a full walk-around promenade and two tennis courts. The location of the gymnasium on the Boat Deck (Cassiopea Deck) is lacking in that it does not offer a panoramic view. The cuisine is probably the strongest point of the cruise, offering a superb choice of Italian and international dishes. The buffets offered simply all you could desire. The service was very attentive and friendly, but many waiters didn't speak English very well (...or Italian for that matter. If you love a casual and intimate atmosphere choose the Sirens Restaurant located on deck 11. You can also eat outdoor (there are two grills near the pools) but there isn't a specific Cafe under a canopy as on board other Costa's ships. The Cabins are very large and comfortable, now offering also a safe and a phone in the bathroom. Many of them have a good size tub. The soundproofing is excellent. The number of cabins for families is limited (third and fourth berth available only in the outside categories ). The entertainment is "European style, offering very interesting shows. An international team of animators offers an ample choice of nice daily activities. There are also good programs for sports lovers. She is currently operating on a Greek Islands itinerary visiting: Corfu, Santorini, Mykonos, Rhodes, and Crete. Many of the ports can be easily explored by taxi but you should probably consider making reservations ahead of teim for the ship's tours of Mykonos and Epidarus. Costa is a family oriented company so children are welcomed and superbly supervised. There was a good mix of international passengers, most Europeans ( Italians, Frenches and German), but the medium age was high (over 50).